From the beginning of time, our Creator has given humankind the gifts of life and unconditional love. One day our God saw fit to give the first fruits of love for us, the sacrificial gift of an only son, Jesus. Jesus gave his own life for us on the cross. He set an example for us of giving unconditionally and of sacrificing so that others might live. We walk in the footsteps of Christ when we give sacrificially. Have you discerned your gift and are ready to make your Sacrificial Giving pledge now? Click on the button below or scroll through and read more about how everything we have is a gift from God so you can plan your gift, then make your pledge. The starting point for Sacrificial Giving is the basic principle of Christian stewardship—that everything we have is a gift from God. In gratitude for God’s generosity, we dedicate a portion of these gifts—our time, talent and money—to furthering God’s Kingdom. What are the Five Elements of Sacrificial Giving? The degree of planning that goes into our Sacrificial Giving reflects the importance of our commitment to give. For most of us, unless we plan something, it doesn’t happen. Unless we consciously incorporate the amount of our giving into our regular budget, it becomes an optional expense and may be lost in the financial shuffle. Planning our giving enables us to give of the first fruits rather than some amount left over after “more important” obligations have been satisfied. The planning process itself can be a spiritual exercise, focusing our attention on our values and priorities— it is called discernment. Planning can also become an occasion for dialogue among family members about the commitment to give and a education to life long Christian stewardship. 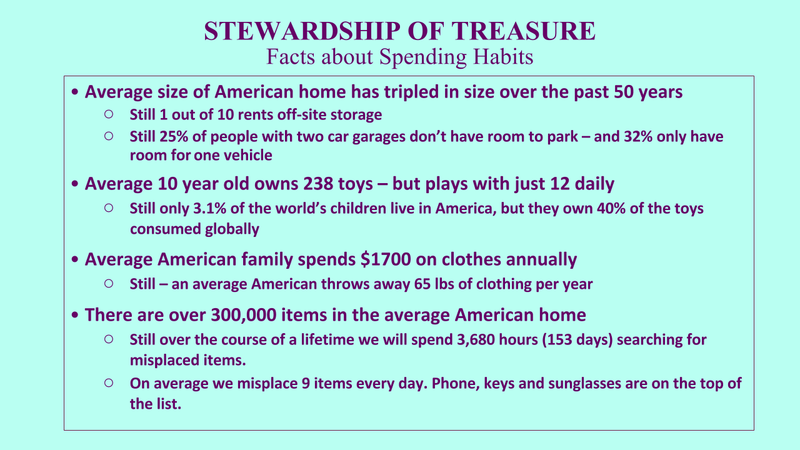 Consider using this planning tool called Other Half Worksheet shared by the Seattle Archdiocese to help you plan and budget your giving. How much should you give? Start with an assessment of your level of giving now. It is certainly a proportion of your resources but is it a proportion which adequately reflects your gratitude for God’s generosity? There is no magic number that represents the “right” amount. Although most people use the biblical concept of tithe— a tenth as a guideline; the proportion you choose should be sacrificial and truly commensurate to what God has given you. In many instances, it is a goal we have to work toward, recognizing that it takes time to re-orient our priorities. 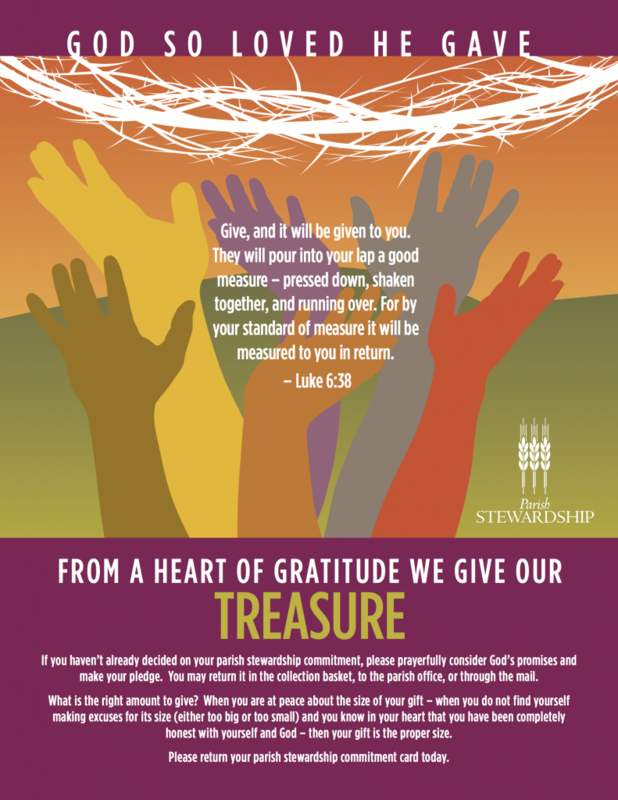 Your Sacrificial Giving pledge is your return to God of a proportion of the gifts God has given you, which you choose to share with your parish. Your decision about your level of giving will be one which makes sense and truly reflects your gratefulness to God for the gifts you have received. Perhaps the most important outcome of Sacrificial Giving is the impact it has on the giver. If you can give your gift and not notice it, it isn’t a sacrificial gift. The element of sacrifice is present when something about your life has to change in order for you to be able to give the gift. You re-order your priorities, you reconsider your values. And every time you give the gift, you are reminded of the reasons why you have chosen to give. Sacrificial Giving is one way we have of walking in the footsteps of our Lord, who sacrificed everything so that we might have life. We give up something of ourselves so that life can flourish. When we give that way we are changed. When giving becomes Sacrificial Giving, it focuses our attention on the true source of our security. Sacrificial Giving bears witness to the reality that God alone will make us safe. Recognizing that reality and living it out constitute a tremendous change in our lives. And this can make an equally tremendous difference to the lives of others. The sacrifice we make by doing without some portion of our substance is just that: doing without so that life for others may flourish. Sacrificial Giving doesn’t buy anything. It doesn’t buy happiness or love or a tenfold return on our investment. The motive for giving a sacrificial gift is not the expectation of getting something back. We are able to give what we give because God has already given to us. Sacrificial Giving is really a response, then, to the generosity of God. We acknowledge that we are not the starting point for the giving, but we are simply passing on a portion of what we have received. The way in which we give our gift is as important as the gift itself. A sacrificial gift has no strings. It is given freely as God has given to us, because the motive for the giving is grateful response rather than expected return. Sacrificial Giving flows out of an understanding that everything we are and have is a gift from God. When we give a portion of our time, talent and treasure—money, we are expressing our commitment to this reality. When we consider our participation in Sacrificial Giving, we need to include our time and talent as well as our money. Just as in giving money, giving time and talent expresses our gratitude to the God who has given us these gifts. Our gifts of money do not substitute for gifts of time and talent. Neither do time and talent substitute for giving of financial resources. All are gifts from God. As you make your decision about the portion of income you will give this year to Saint Patrick Catholic Church, to the Seattle Archdiocese by way of the Annual Catholic Appeal other charities, consider as well what you will give of your time and talent. People make the time and find the money for what they value most. We must challenge each other, as disciples of Jesus Christ, to value God above all else. This belief will lead us to put our faith in action by finding the time and money to promote God’s priorities because we have made them our priorities as well.